Hannah woke up at 6 this morning… the 1st time since we changed the clocks that she hasn’t slept in. I got up with her but I really wanted to go out to the barn. I heard lambs baa-ing over the baby monitor and wanted to see what was happening out there. I didn’t want to bring Hannah out in pj’s so I waited till Grandma woke up. Abigail and her lamb were fine, Rosy and her twins were fine.I put Annie in her lambing stall yesterday because I thought she looked ready to go and, sure enough, she had twin lambs cuddled up to her. They were mostly dry so I gave all 3 moms some hay and went in the house for breakfast. I weighed and checked them out afterwards. The ewe lamb was 9.75 lbs and the ram lamb was 11 lbs. We already have more ewe lambs than we did last year! This entry was posted in farm, sheep and tagged Abigail, Annie, lambing, Rosy, Tunis. Bookmark the permalink. there is nothing cuter than baby lambs! I just love reading your lambing updates! 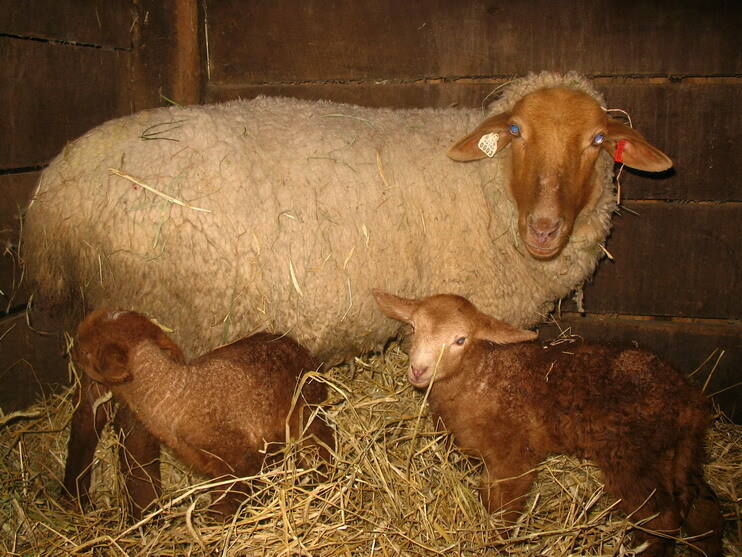 Yesterday was not a good day on our own little farm – one ewe died during childbirth (in the middle of the night). Sadly, I was completely unaware – I’m going to “steal” your baby monitor idea – Brilliant!